All hardware (ring, blade & clip) are stainless. 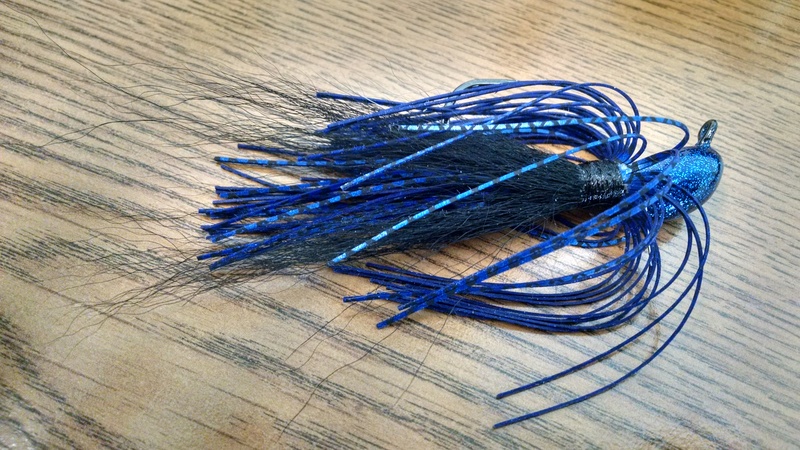 All bucktail and silicone skirts are hand tied and cemented. I pour my own heads using either mustad 32798 (all football sizes, 4/0 or 5/0 3/4oz and 1oz streamlined heads and 3/8oz arky heads) or mustad 32796 (sizes 3/8 up) 60 degree flat eye jig hooks. Powder paint finish. Last edited by onthewater102 on 07 Aug 2017, 15:28, edited 4 times in total. Very nice! 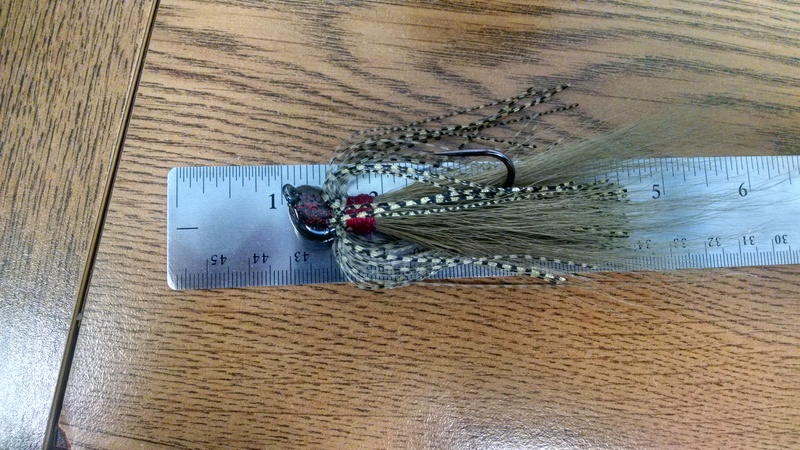 Do you make bucktail chatterbaits? I would be very interested in those, if you did. 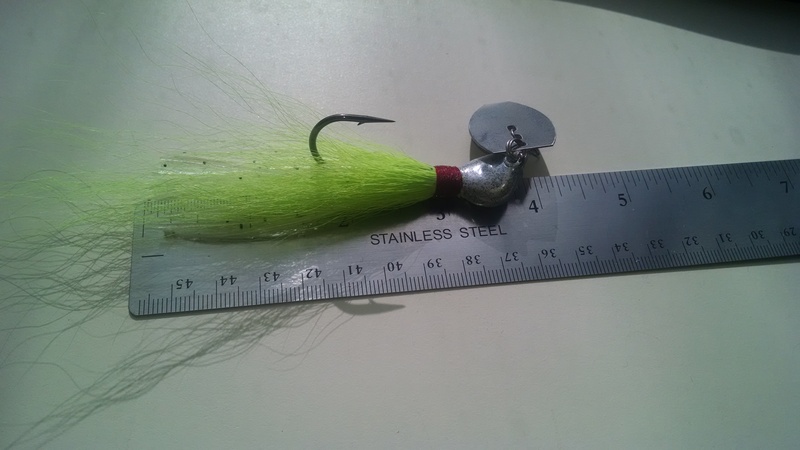 I certainly can - I have plenty of bucktail in a variety of colors - what were you looking for in terms of sizes? 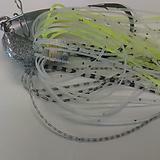 For patterns obviously a white/silver accent baitfish will be easy - same with a green/brown craw pattern. Last edited by onthewater102 on 18 Mar 2017, 15:18, edited 1 time in total. White, white with red stripe, black or black with blue stripe, chartreuse, white and chartreuse, green pumpkin, maybe a pink one with silver accent? Silver and gold accent stripes would be great, as you see fit. Looking to use these with swimbait trailers in saltwater. 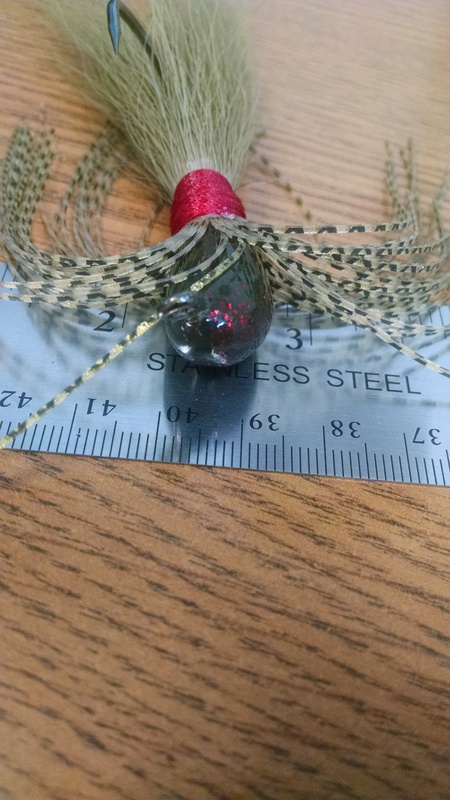 Do you have 1/2oz arkie heads with 5/0 hooks? I'll likely get all 1/2oz and a couple 1oz baits. I really like this one below. Great looking bait! I'll have to let you know about quantities because I'm going to ask my buddies if they want any. Last edited by Butthead on 03 Mar 2017, 10:19, edited 1 time in total. If I don't have any readily made I can certainly make up 1/2oz arkies with 5/0 hooks - they will be Mustad 32796 heavy wire hooks, those are the ones that work best in the 1/2oz mold. So I'm reading this correct you're looking for 1 of each of 6 patterns? 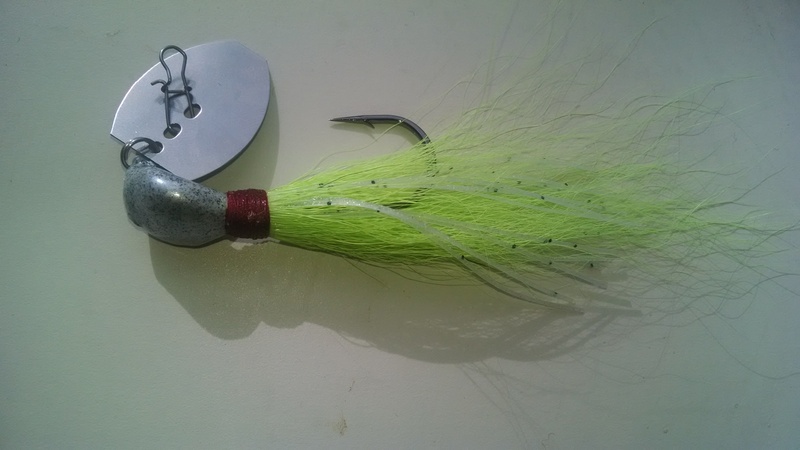 The only color you mentioned that I'm not 100% certain I have in bucktail is chartreuse - but I will double check. To be clear, you're looking for all natural materials save for some flashabu correct? No silicone mixed in but feathers are ok? I only ask about the silicone use in the case of accent colors - the red on the white, blue on the black etc. Let me get back to you on exact quantities, because I need to find out from my buddies what they want. Well, I didn't realize bucktail AND silicone mixed was even an option. If you can make the below with silicone accents awesome, if not flashabu is just as good. I definitely don't want any feathers though. 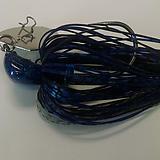 If you have 6/0 hooks for the 1oz rigs, I would go with that over the 5/0. I'd also like them all wrapped with red string if possible. I cannot do arky style heads bigger than 1/2 oz, so the 1oz will have to be a football head. PM sent on the details. 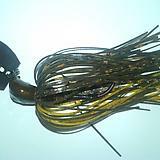 I can make the 3/4 and 1oz in a head style somewhere between a banana jig and an arky now. Last edited by onthewater102 on 18 Mar 2017, 15:19, edited 2 times in total. 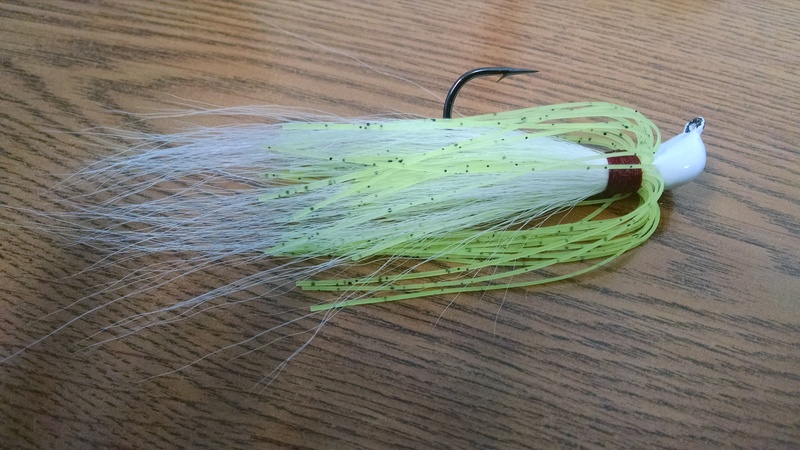 Chartreuse with a clear silicone w/ green & black flake accenting - silicone inlay in the bucktail shown - can also be done with a second application of silicone to achieve the chandelier effect. Last edited by onthewater102 on 18 Mar 2017, 15:21, edited 1 time in total. 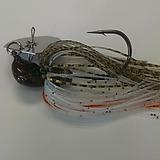 ..."Many" custom chatterbaits later, ha-ha! I'm really excited to try these out! These look absolutely sick! I am so stoked to get to use them! I want to order some. The biggest I have a 1oz football mold and a 1oz mold that is something between an arky and a banana head. Either can be done in a 6/0 Mustad 32796 hook. 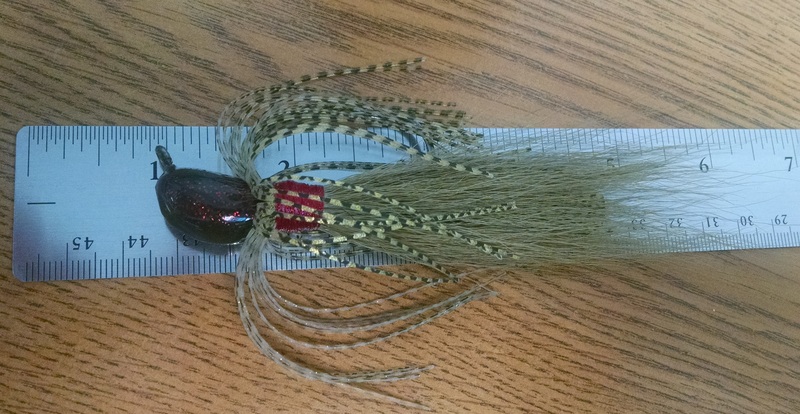 Here is a hybrid bucktail bait that used the non-football mold so you can see the head shape - it's quite streamlined but the lead is carried quite a ways down the shank of the hook. The lead ends where you see the red thread wrappings. Last edited by onthewater102 on 07 Aug 2017, 15:28, edited 1 time in total. I'll take 5 (chatterbaits) of them please.